Who doesn’t dream of ditching the cubicle for the fresh air of farm fields? It’s a common desire to leave the rat race behind and cultivate a closer connection with the land, but for most of us, the idea never gets off the ground. But here’s the reality; the barriers to entry towards starting your own small farm business aren’t as extreme as you might think. It’s entirely possible to move your life towards a more agrarian aesthetic without blowing out your bank account or losing every weekend to backbreaking work. If you’re interested in learning whether a small farm could be in your future, then this article is for you. While the news about the state of sustainable agriculture can often sound bleak, there’s good reason to consider starting your own small farm business. Contrary to the belief that most farms belong to mega-corporations, over 97% of farms in America are still family owned. 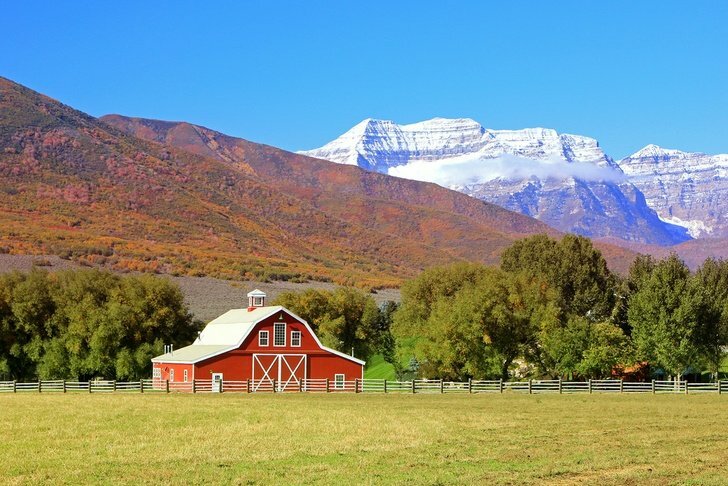 An estimated two million small farms (ones that make less than $350,000 each year) are located across America today, and globally, they form the backbone of the entire agricultural system. Is it time for you to join the movement? Starting a farm business can come with significant sacrifices, including a loss of things like a steady income, your employee retirement account, and health insurance. Even so, millions believe that the costs are well worth it for the power to control their days, work outdoors on passion projects, and manage a small business that makes them feel like they’re making a positive difference in the world. Not everyone has what it takes to start a small farm business. Answer these questions honestly, and if you find yourself saying no, you might want to reconsider if your vision of farm life is more romantic than reality. Are you comfortable working outside in any weather condition? Do you like tinkering with tools and engines? Are you able to identify what needs to be done and prioritize based on importance? Can you make plans for the future while remaining comfortable with in-the-moment changes? Are you able to move forward from failure effectively? Can you handle hours of mundane, physical work? Are you a generalist who is skilled in a variety of fields? Are you willing to be a lifelong learner? If you are still willing to consider pursuing a small-scale farm, the following tips will get you started. There’s no point shying from the truth; starting a farm in any form is an arduous undertaking. The following tips provide a guideline for how to start a small farm business. One of the best ways to learn whether you’re cut out for farming is to gain real-life experience. Before diving into your own venture, consider volunteering on an established farm through a program like WWOOF or Workaway. The more firsthand experience you gain the better, so consider investing the time to volunteer on several farms if possible. This will give you a better perspective of what a farm business entails and will expose you to multiple methods for making one succeed. In the beginning stages, it’s also smart to make a connection with a farming mentor who can walk you through the complications of establishing a business. You can connect with someone in your community or reach out to the local USDA office for potential options for a more formal apprenticeship. Find a USDA center near you with this link. As the conversations begin about your future farm life, it’s vital that you define whether you’re looking for a hobby farm experience or want to establish a business. Maintaining a hobby farm gives you the opportunity to live a farming lifestyle without being financially dependent on it. Hobby farmers often work off-farm jobs or have enough savings to support their lifestyle. Sometimes the property is profitable enough to cover its expenses, but not always. Farm businesses, in contrast, make it a priority to be profitable. No matter which direction you go, it’s crucial that you’re clear about your expectations from the beginning, as a hobby farm is managed much differently than a business. That being said, it’s okay (even recommended) to start small when you’re first beginning. Raise a homestead-scale garden for a few years before branching into market production, and test the waters to see what you both like and excel at before investing in an enterprise for profit. Every farm business looks different, which is why you need to be as transparent as possible about what your goals are from the onset. It’s important to clarify what your profit goals are and what the “minimum viable return” from your enterprise should be. This gives you a clear blueprint for how much time and money you are willing to invest in your business before backing out. This planning stage also gives you the chance to define your non-monetary goals for your business. Are you primarily looking for a lifestyle that lets you connect more closely with your family? Do you want to make a positive impact on your community and the planet? Visualizing what an optimal small farm business would look like for you makes it easier to identify when you’re going off track. A small farm might feel like a passion project, but if you want it to be a business you need to treat it like one. This means that you need to establish a business plan with hard numbers and budget requirements so that you have a roadmap for getting started. At this stage, you can also articulate details like how many hours you want to work a week, whether you want any employees, how you plan to measure customer satisfaction, and other pertinent information. This step might seem overwhelming, so follow the advice from the USDA for setting up a farm business plan. One of the most significant barriers for would-be small-scale farmers is securing the capital to get their idea off the ground. New businesses rarely make money their first few years, and farm enterprise is no exception. For this reason, it’s critical to have a survival plan in place to act as a financial buffer to help you navigate the instability. Some small-scale farmers maintain outside jobs, while others don’t start their businesses until they have sufficient savings or have a plan to take on as little debt as possible. It can be challenging to secure standard business loans for establishing a farm, but there are several unconventional options for finding financial help instead. Crowdfunding can be an option if you have a strong business plan in place, and the newly-established company Steward promises to help small-scale farmers raise capital through “crowdfarming.” It’s also possible to finance projects through grants, both through the USDA and non-governmental organizations. Some resources for starting your search include the ATTRA Sustainable Agriculture Program, and the Conservation Loan Program. It’s smart to perform some research before committing to a distribution strategy, so pay attention to how farms near you sell their products and where your key customer tends to hang out. Waiting until you have a product to sell is too late to begin marketing your farm. Instead, it’s a smart idea to create a website (or at least a Facebook page) for several months or even a year before you go into business. This will help you build brand recognition and cultivate a following of people who will be enthusiastic to buy from you as soon as your product is ready. Not sure how to deal with online promotion? The Small Farm Academy is a smart place to start. Your small farm venture will survive or perish depending on what you decide to sell. If you’re filled with motivation but short on ideas, these slightly unconventional suggestions should serve as inspiration. Growing vegetables to maturity can be overrated; why not sell them at the seedling stage instead? For those located close to their target market and with minimal growing space, few farm businesses are more profitable than selling microgreens. These young plants can be cultivated from a variety of seed mixes, though popular varieties include spicy lettuces, beets, broccoli, arugula, and kale. It’s common to harvest microgreens at an inch or two in height, and then mix them into salads for a high-end garnish that packs a flavor punch. All you need for production are standard plastic nursery trays and greenhouse or indoor space for growing. As microgreens typically reach maturity ten days after planting and last less than a week after harvesting, this is a business venture that makes the most sense if you can sell directly to the consumer (high-end restaurants tend to be ideal). Small-scale beer and wine production is booming in popularity, and many breweries and wineries are desperate for local-grown grapes and hops. Consider turning an acre or two of your property into production, and you’ll have a lucrative crop to sell to the highest bidder. Establishing the systems for these crops is an investment in time and finances, but the result can be profitable for a small farm business. Just make sure you complete plenty of research before beginning, as vineyards and hops require unique cultivation strategies to be successful. Sometimes the best farming strategy is to provide resources other farmers want. Many urban farmers are willing to pay a premium for quality compost, and worm castings are some of the best available. You can set up a largescale vermiculture system if you have a steady supply of food scraps to take advantage of. Consider asking local farmers or even grocery stores to donate their waste produce to you, and you’ll have a convenient food supply for your worm population. Many small-scale farmers have a flock of chickens, but far fewer raise meat rabbits. That provides a perfect niche opportunity for the adventurous farmer, as meat rabbits are an incredible source of protein that’s surprisingly easy to raise and process. Considering how little space they need, you can quickly scale up your meat rabbit production to provide a sizable income for your small farm. If you’re looking to get into crop production but want to stand out at the farmers’ market, then it’s worth considering a cut flowers business. Some growers produce as much as $50,000 in sales per acre, proving that it can be a potentially lucrative business venture. You can expand your services further by tapping into the wedding market by providing flowers for venue decorating. Strange as it might seem, you can start a profitable farm venture from raising insects. Pet stores, organic gardeners, and vermiculture enthusiasts are often willing to buy bugs, and you need very little space to make it happen. Some stellar options to consider include nightcrawlers, black soldier fly larva, crickets, ladybugs, and red wigglers.